I'm really just looking for advice or a guide that outlines what is or isn't possible, and what is required to make such a thing possible. If someone knows of such a page/thread please post that here. I'm trying to figure out what all is needed to make a nexus 7 2013 (wifi only) work on freedompop's service. I have a nexus 7 (2013) wi-fi only model, that and my laptop are the only devices I own. I'm interested in knowing if I can use Freedompop's service (in any capacity) with the nexus 7 I own. I feel like I've done much *much* research and I can't seem to find anything conclusive or one place with consolidated information on what to do. Some places I have read only the LTE version works. I have also read people talking about using a widget called PPP. Using that along with what people call an OTG adapter and a powered usb hub. Although I hear that PPP does not work with android 4.3, and PPP Widget 2 is recommended. I also didn't hear anything conclusive on that actually working. I see that PPP Widget 2 was released to the google play store on July 12th, anyone have experience with that? At it's simplest - I want to use freedompop with my wifi only nexus 7 so that I can occasionally have connectivity on the go, for free. I am going through all of this in such detail, because I don't want to succumb to a registration and purchase process that results in nothing working. Which then I'd have to go through and cancel accounts and subscriptions. I want to avoid that. What are the set of steps I must do to get freedompop access with my nexus 7? Is it impossible? 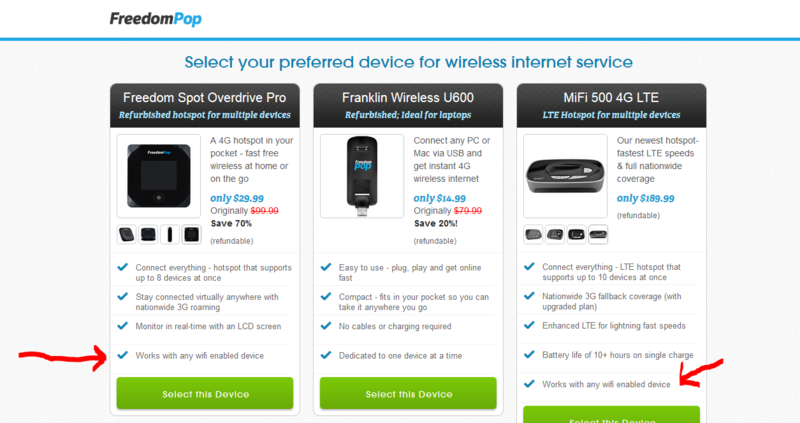 Which freedompop device should I select for this? Which OTG adapter can I buy that has power injection or a powered usb hub? Do I need to have the tablet connected to a OTG adapter connected to a powered hub? That feels a bit troublesome and portability prohibiting. Do I need to root the phone? Hey @muradin007, we do have Wi-Fi hotspots available for your Wi-Fi Only devices. I personally would recommend the MiFi 5580 LTE. @muradin007 there is also a wifi only solution, where you just install the FP WiFi app and make calls over WiFi. The app is named FreedomPop Free Call and Text. You can use it with the MiFi 5580 LTE when you are not around stationary WiFi hotspots. "works with any wifi enabled device"
Does that mean that the Freedomspot Overdrive Pro would also work with my wifi only nexus 7? Would this allow me to use data when there is no wifi available? I'm not so interested in making calls or sending SMS, my primary objective is internet access and Data.